Here’s just a quick reminder that homemade products stick out like a sore thumb. Have you ever encountered a product that was clearly not professionally produced? They just look awful, and one look at them screams, “Homemade!” or “Unprofessional!” It doesn’t take long for consumers to sniff you out and flee. 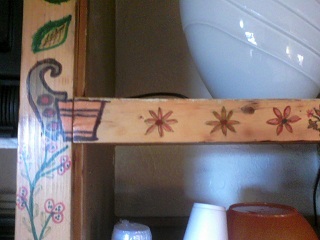 This past weekend, my wife and I stayed at a little ‘mom and pop’ motel in a little town in Colorado. With one step into the room, I got a good reminder of this issue. 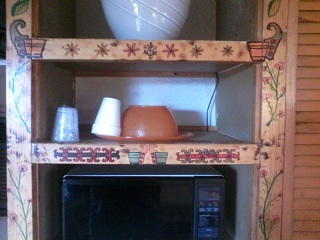 (See the pics below from my crap phone) The entertainment cabinet was hand-painted, and looked awful. I nearly fled the room, but decided the cost was cheap enough to entice me to stay. It turned out fine. But ugly little piece of artwork really drove this point home to me. Consumers do not like hand-crafted products. Let’s face it… we live in a consumer-oriented world. Almost every product we touch is machine made, and professionally crafted for maximum emotional indulgence. Think about the indulgent products you use on a daily basis: $50,000 automobiles… iPhones… stylish eyeglasses… jewelry… and more. Every product we use it slick and well-designed. So consumers are used to those kinds of products. Now slap and homemade software product in front of them, and watch them flee! Or a poorly polished plastic drinking cup… or any other product you can imagine. Consumers expect high quality. This issue is especially true in software, where programmers are sometimes responsible for developing the entire product from code to help files to graphics. Software developers just don’t have the talents for all those jobs, and it’s very obvious when they try. 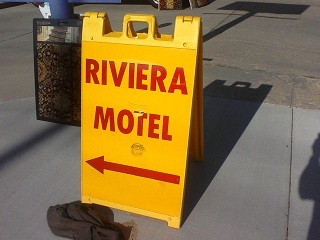 The results are a lot like the Riviera Motel. Can you guess where it’s located? That has certainly been true in my life. To me, business has been something deeply ingrained in my life. For many years, I wrote code on Christmas Day, New Years Day, Independance Day, and many other holidays. I would do events I called “24-hour weekends” where I would start coding at 7 AM each morning and go straight until 7 PM on both Saturday and Sunday — two twelve hours days. And then I would resume my normal 60-hour week on Monday morning at 5:30 AM. That’s how much I loved my business. Things have changed a little since I’ve gotten older. Economic downturns turn you hard. Turn you bitter. Make you cynical. And you say, “What good was all that work?” So yes… I’ve had times where I’ve quit and vowed never to do that again. I’ve actually quit my business several times. But like a dog to his vomit, I’ve always returned. And after doing that a dozen times, I guess I’m here for the duration — a lifer. I still love my business. The current economic doldrums put a severe throttle on my work efforts. It’s awfully hard to put your life into something (and that’s what Henry was really saying in the quote above) when customers don’t reciprocate with any degree of appreciation. But I still work hard. I might even pull a few of those 24-hour weekends from time to time just to remind myself of the love I still have for my business.